Proceedings of the Ninth Vertebrate Pest Conference, (VPC-1980). Published at the University of California, Davis, June, 1980. 235 pp. 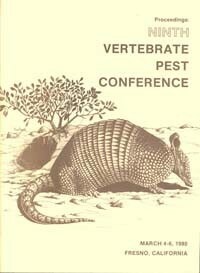 Description: Proceedings of the 9th Vertebrate Pest Conference March 4-6, 1980 Fresno, CA, arranged by the Vertebrate Pest Council of the Vertebrate Pest Conference Editor Jerry P. Clark and Assistant Editor Rex E. Marsh. Description: Exclusion of Gulls from Reservoirs in Orange County, California, Environmental Manipulation if Roof Rat Control, Programs and Hazards to Small Mammals Associated with Underground Strychnine Baiting for Pocket Gophers. Out of print, an unbound copy is available.